Do your feet need a little pampering before slipping on sandals this summer? What about those elbows? Wisconsin winters can do quite a number on my skin while it’s hidden under layers of clothes and wool socks. Exfoliation tends to cause my skin to break-out or itch, so it’s been a long journey to find the perfect product to use when spring rolls around… until I found sugar scrubs! A sugar scrub is a wonderful way to exfoliate and moisturize at the same time – add some essential oils and you’ve got a spa treatment. 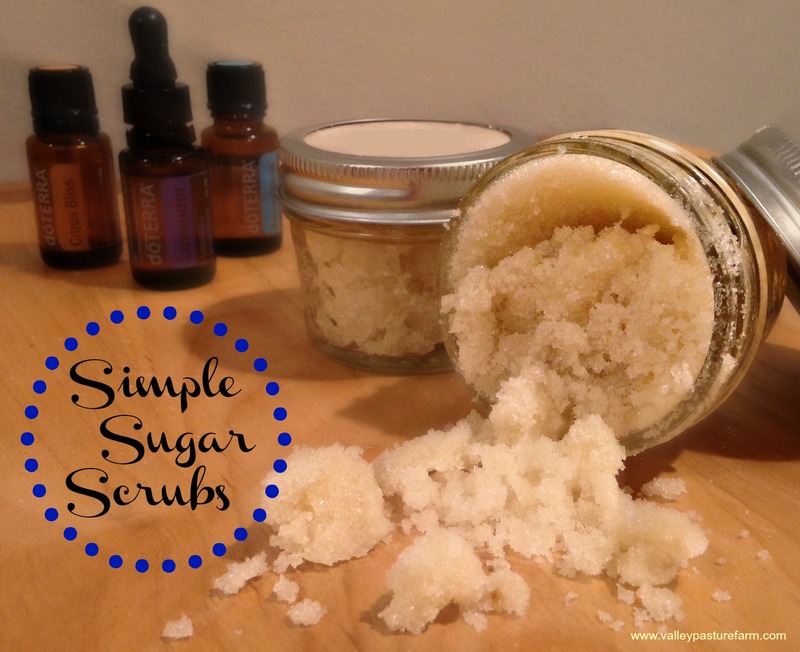 Plus, sugar scrubs are super easy (and cheap) to make at home! 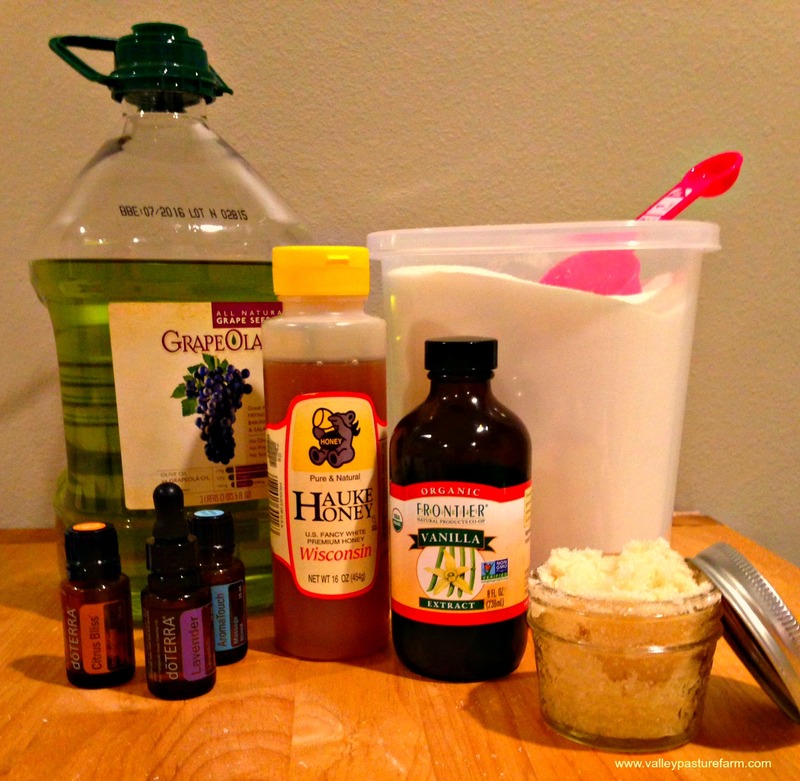 Read on for my Simple Sugar Scrub recipe. I prefer sugar scrubs because sugar is not as abrasive as salt and is great to use on sensitive skin. This recipe can easily be doubled (or tripled!) depending on how large your container is and how often you use the sugar scrub. 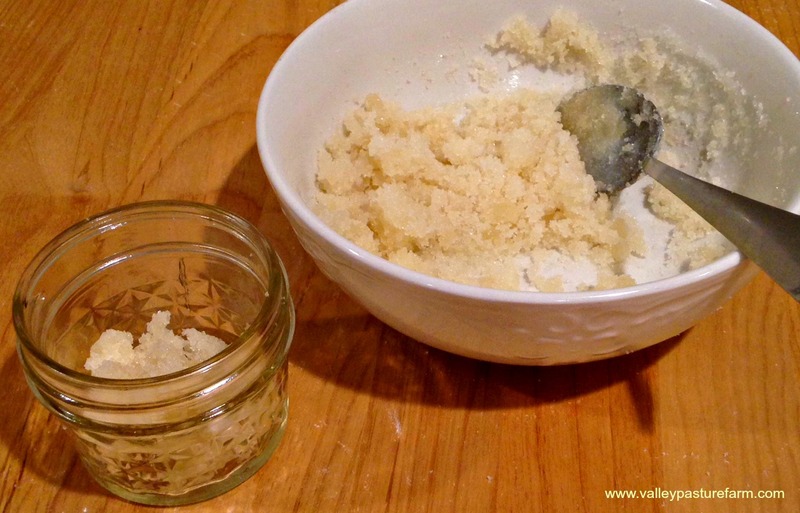 If stored too long, the sugar scrub can get hard – I make about a month’s worth at a time. Combine the following ingredients in a bowl and mix well. Then place the sugar scrub in a glass container that seals well, like a mason jar. This recipe fills a 4oz jelly jar. Soften your skin by soaking ten to fifteen minutes in a warm bathtub. Drain the tub and pat yourself dry. Rub the sugar scrub on your skin with your hand or a rolled up damp washcloth until the sugar scrub is dissolved, spending at least a minute or two on any rough areas (knees, elbows, feet). If you go too quickly, you will not get the full exfoliation. When you’re done, rinse under the shower. Using the sugar scrub once a week should keep your skin smooth. Never use a sugar scrub on your face. The exfoliation is too harsh. If you feel you need more exfoliation, try a salt instead of sugar.